Web for Faculty (referred to as Banner) is a CIT student information database for grading and accessing student information. It provides academic staff with secure access on campus or at home to the information needed to manage the modules they teach. What functionality does Web For Faculty provide? Display the component breakdown of your module, showing types of continuous assessment, final exam and the percentage of marks associated with these. How do I get setup on Web For Faculty? Your CIT staff ID number. You will then be sent an email from the Web for Faculty office, giving you a CRN (Course/Class Registration Number) for the module you are teaching. THE CRN is generated by Web for Faculty office and it is an identifier code for a class group taking a module. The CRN is an important number as there will be situations where a particular module will be taught to a number of different class groups either together in the one sitting or separately. While there is the one module code there can be many CRNs associated with it. How do I access Web For Faculty? 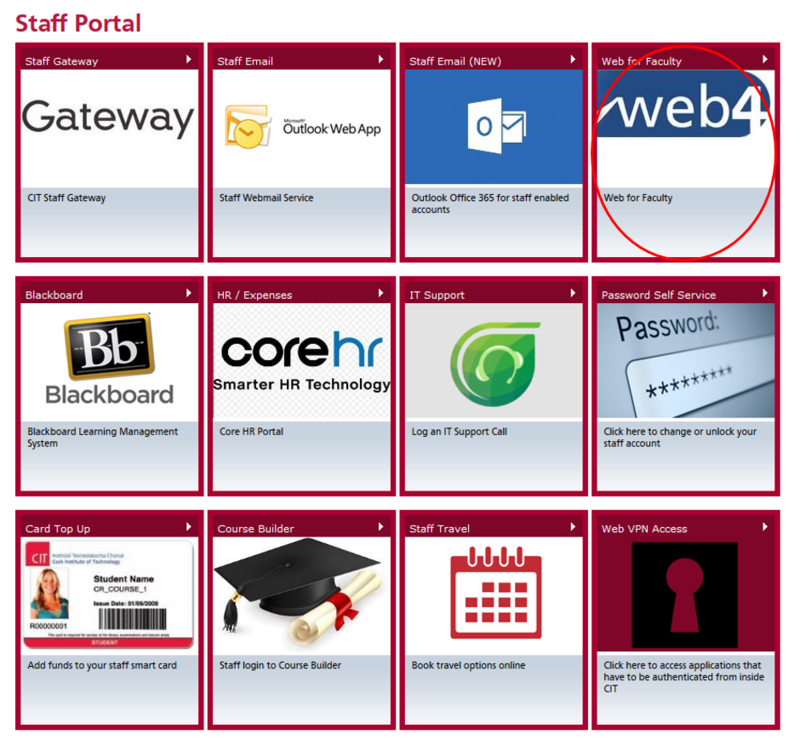 Web For Faculty can be accessed through the Staff Portal. Initial log in will require a User ID and a 5-digit pin. Your User ID is your CIT staff ID, a 5-digit number which is printed on your staff card. Your Personal Identification Number (PIN) is a six-character code used for login validation. On initial set-up of your account you will be assigned an initial PIN to enable your first login. Once logged in to the system, you will be directed to the Faculty Services tab which gives you access to student information including email and assessment grade sheets. Term selection allows you enter the term you are teaching on so as to obtain the current student information and class lists. To select an academic year, click on Term Selection.